The Oru Airport Ninja travel case is light & sturdy, big enough to pack a full sized bicycle, but small enough to avoid those hefty fees the airlines love to charge to anyone travelling with a bike. Matt McNamara flew his to Asia, and returned with this review. You roll into the airport dragging your pride and joy bike behind you, just hoping you can slip through unnoticed when they ask: “What’s in the box?” If it weren’t for the rolling closet on wheels at your hip, you might breeze by, but there it is. Bang! Minimum $150 (at least) up charge to fly with your bike. I flew from San Jose to LA for 3 days in March to attend the Team Axeon training camp and the roundtrip for my bike was twice what it was for me! 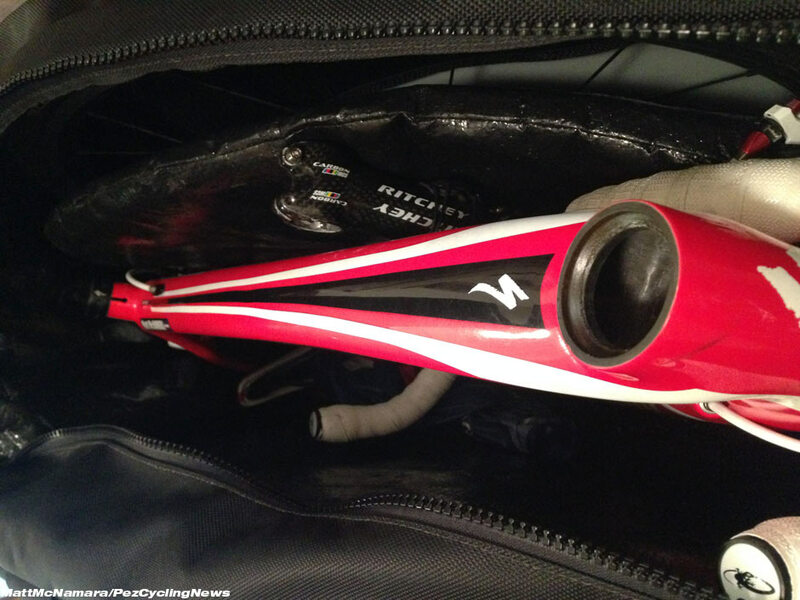 I recently accepted the PEZ assignment to fly to the Taiwan KOM Challenge and immediately thought about this cool little travel bag my friend Scott had brought to the USA Cycling Regional Development Camp last summer. He said it was slipping past the baggage check-in without the fee, every time. I almost pulled the trigger in July, when Scott first introduced me to Isaac Howe and his Airport Ninja, but I didn’t have any trips planned and was still reeling a bit from the March baggage fiasco. Fast forward a few months and fortune looks my way with the trip to Taiwan. Now I needed a bag. 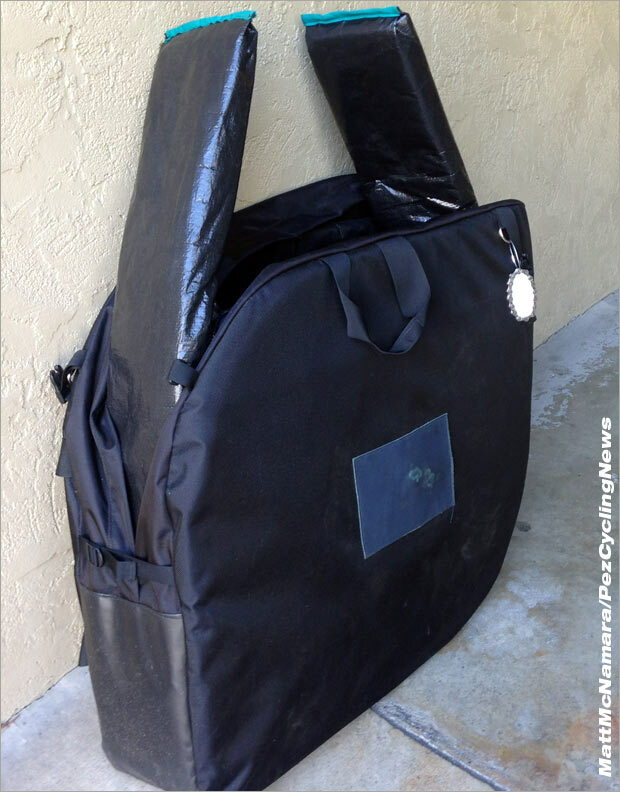 "strive to create simple innovative luggage to save you money so you can travel with your bike more often and to more places." I asked Isaac if he could lend me one for testing, and he came through in quick order, took my bike size and sent back a finished case in less than 10 days. 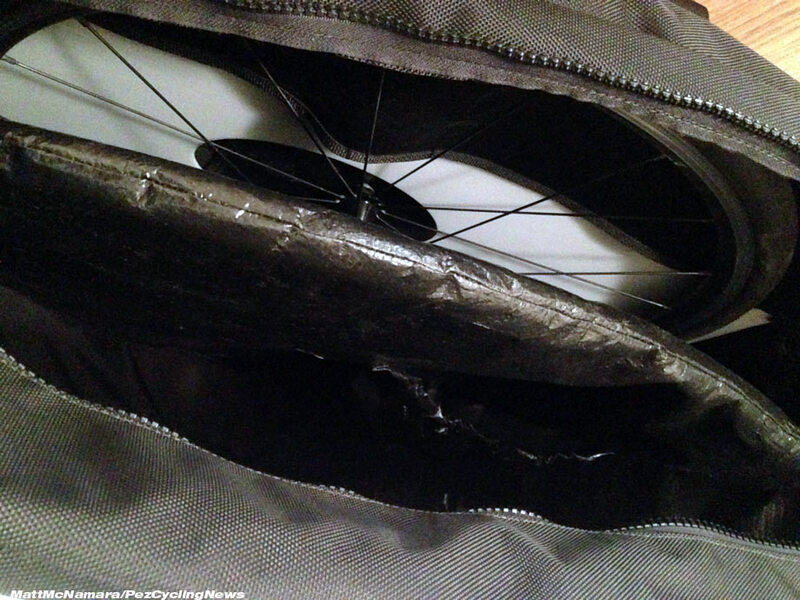 The Oru Airport Ninja case opens at the top, and nestles the bike inside a large padded ring. Oru. Taken literally it means folding. The art of the crease. Origami is one derivative. A friend who translates Japanese passed along this: “...a funny thing is that "home wo oru" means literally "break a bone" but then it also means you made such a great effort in colloquial Japanese. Also, origami has another meaning. It's a certificate, a certain document stating that this is a genuine/for real/approved/etc.” Good name. The Howe’s have a good name too. 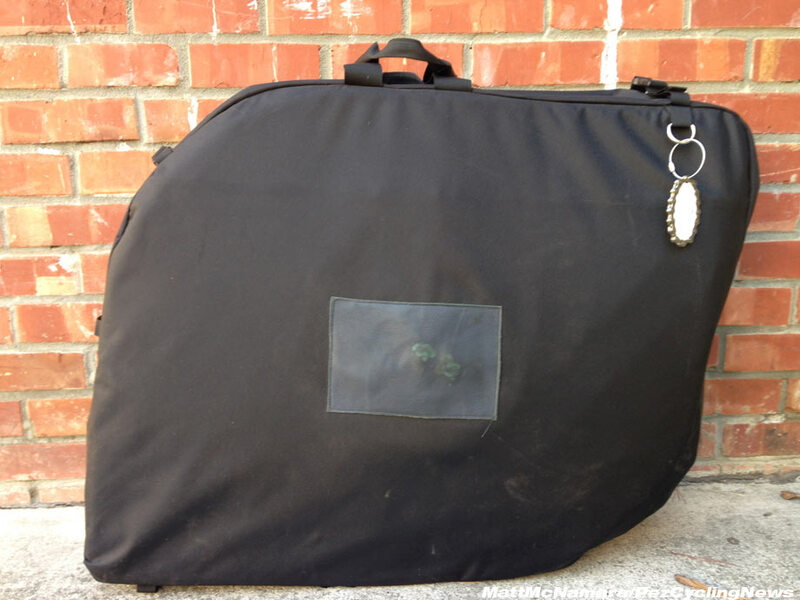 Isaac and Elias are brothers from Vermont, who as pro racers, decided to reduce their own travel costs by designing a bike case that fit within the airlines' suitcase measurements - thus saving hundreds of dollars in unnecessary travel charges. l. Isaac is an established domestic pro with a nice palmares across teams like SmartStop, Kenda, Champion Systems and Mtn Khaki. He has a biochemistry degree. Brother Elias has one too, but he went one step further adding a degree in Chinese too. Working from a small facility in Vermont they produce a single product with an enviable attention to detail, constantly refining a process started at the 2012 Criterium Nationals in Vail, CO. Isaac had brought his first version of the small Ninja case to the race and it was an immediate hit. Living on the road and avoiding airline fees are as much a right of passage as potential disaster to racers everywhere, so saving $150-300 dollars per trip means getting more weeks on the road and more calories in the tank. Big buckles keep the case secured. Fast forward a few years, and several hundred custom built cases, and you arrive at the current version of the Oru Airport Ninja. Early on they used to make each case using the actual dimensions of the customer's bike and a CAD machine to make it just perfect. A time demanding enterprise to be sure. Today they still custom-make every case, take your frame dimensions, anticipated uses, etc., but Isaac noted that the difference in case dimensions between a 51cm frame and a 57cm frame is only about 2 inches. Given that, most bikes fit in one of their three main size templates. If yours doesn’t, no problem... they’ll stitch it up full custom to the same exacting standards of every other case. Mine measured 26H x 38L x 11W. Unlike other travel cases that open like a clam-shell, the Oru opens along the top end, allowing the bike and wheels to be dropped in from above. To keep things within those airline dimensions, this requires removing the wheels handlebars, fork, pedals, and maybe a couple other parts. But anyone who's packed a case knows how quickly bikes come apart these days. • There is no template for what the “right” way is. Experiment! • Keep all your headset pieces together on the fork. Consider a plastic or other cover to avoid grease everywhere. • Pull the rear derailleur, perhaps even the whole derailleur hanger etc. • Build ‘Space’ around the frame. Avoid having hard edges where impacts are translated directly into the frame. To get to the airlines' magic “62 Linear Inches” goal - the size at which oversize baggage fees typically kick in - you need to remove the front fork. This may seem a huge concession, but most forks come off with just 4 bolts. It can be messy, so plan ahead, but pulling the fork is minor and gives you a ready chance to inspect and perform any needed maintenance prior to the rebuild. Win win. Attention to detail was noticeable when I first pulled the case from its box. 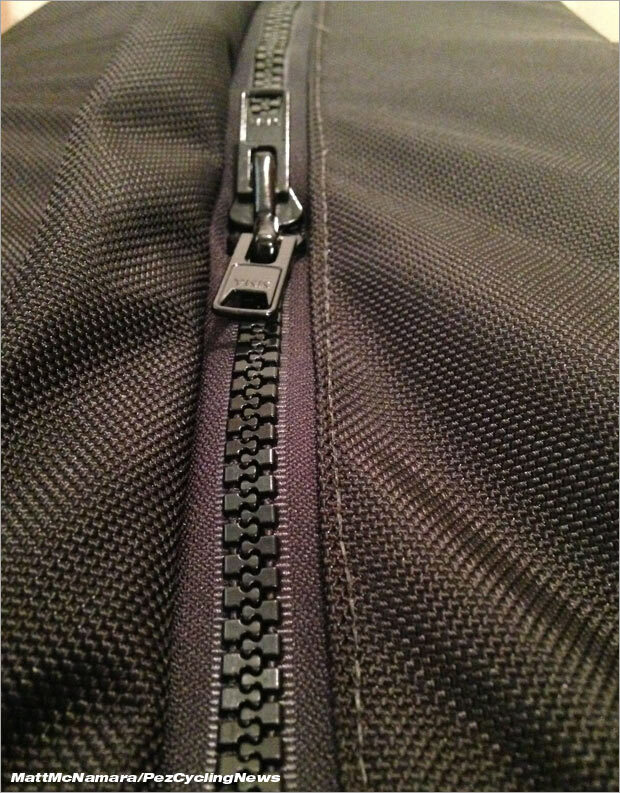 A heavy grade zipper was the first clue. “A number 10 toothed” zipper, Isaac told me. They double stitch most everything and use a heavy grade bias tape on the main pad, covered in a sturdy plastic cover for durability. The case is simple, almost elegant. There are no wasted parts and little wasted space. As I got better at loading the bike I started finding those little nooks and crannies that seem almost pre-planned. A helmet tucked nicely in the rear triangle. Pump, wrapped in foam and secured. Spare tires. There is an ample pocket for additional storage as well. The wheels sit nicely on either side of the frame, and are encased in heavy padding, with a set of plastic inserts to help add some rigidity. One noticeable demeanor of the company is that they want the details just right. They are constantly working to refine production and streamline the supply chain to improve delivery and quality. Bumps and hiccups are an inevitable part of that process. 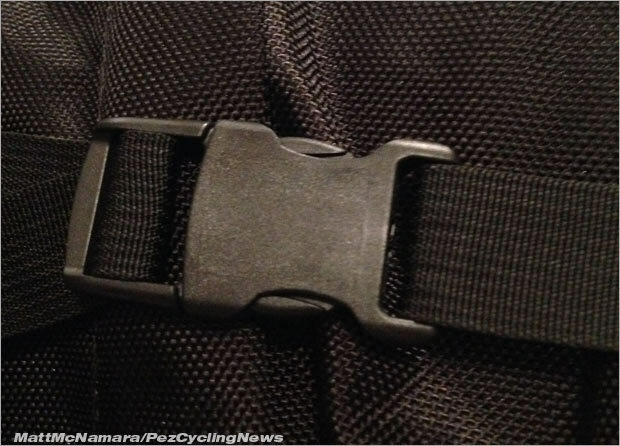 For example, the case has a cool set of back pack straps that make it easy to carry the bike and your luggage too. They work well, love the utility and common sense of the idea, but there wasn’t a lot of padding on the straps in this iteration, and unfortunately I had a small piece of the buckle break during the trip, rendering it unusable. Fortunately, it is easy to replace with a heavier model via a local seamstress, so a minor inconvenience overall. When asked, Isaac noted the strap was one of two models they use and ended up being a bit less durable than they planned. Future models will have a sturdier buckle. All part of the process of feedback and refinement that comes from maintaining a close communication loop with each customer. In looking to the future, Isaac takes a similarly measured approach. They are planning additions to the product line incrementally, likely to include mountain bike bags, accessories, and new bag options for other travel needs. As long as things meet company standards and serve the broader vision, he’s open to whatever helps the most. I’m eagerly anticipating accessories like a front brake sleeve and fork cover. Did I remember to take off the cycling socks? One of the most important tenets of avoiding additional fees for your bike is how you sell it at the check in counter. You have to sell indifference and every day business traveler in the same moment. Showing up like you’re just back from vacation at Bike World or the Tour de France is a sure path to derailment. Being belligerent or short tempered doesn’t help either. Polite, professional, and an I-do-this-all-the-time demeanor is a good starting point. On my flights, three legs in all, I managed to avoid additional fees for the bike every time. Every agent asked me at least twice what was in the bag and my nearly wearied “tradeshow exhibit” always carried the day. Be sure to know what the individual and total weight limits are for your travel. I got nailed for over weight baggage on the short hop to Hong Kong because they have lower limits than International flights. I might have avoided the charge if I’d put a few more items in the Airport Ninja case, but didn’t know if it was “per bag” or total weight that I was over, and I didn’t want to elicit additional scrutiny by being difficult, so I just paid the $104 and made a mental note not to buy so many souvenirs on my next trip. Few things in cycling are more enjoyable than exploring new roads. The world is full of fantastic rides, events, races, and roads just waiting for you to find them. Airline travel with said bike is at the other end of the spectrum experientially. High fees and haphazard attendants are just two of the considerations one must take in when thinking about flying with a bike. Fortunately, we have the Oru Airport Ninja to help alleviate some of the stresses associated with bike transport on aircraft. This is for two reasons, first the quality of protection offered by the Airport Ninja is extremely high for a soft sided case. There is ample padding and the ability to create enough dead space in the compartments that your bike won’t have to take the brunt of any major impacts. Second, the Oru Airport Ninja is well within most airlines 62 linear inch requirement for avoiding an oversize baggage charge, and if you apply the appropriate ninja stealth mindset to the process you can ably avoid those charges time and again. Better still, at only $399 complete it is a reasonable solution, that will more than pay for itself in as little as two flights. Whether you are the one dropping hints or you just want to give that one memorablegift that won’t soon be forgotten, either way you’ll be working with and supporting a small, locally owned, cycling business that exists to make great products and relish the lifestyle we’ve all chosen. I love mine.